Stress is the #1 enemy of millions of people today. This is due to our hectic lifestyles, as well as the demanding reoccurring responsibilities at work and home. The problem is that many of us don't realize how stressed we are in “normal” daily life. Unfortunately, increased health and wellness issues prove just how much stress affects us as a society. If you are struggling with obesity, heart disease, high blood pressure, diabetes, insomnia, depression or other chronic health issue, these are all directly related to stress. In addition to those specific health problems, stress can also create rifts in personal relationships, cause you to function poorly at your job and bring financial hardships at any point in time. Stress isn't something that you can’t simply ignore – it builds up and does not go away on its own. Here are 12 ways to manage stress, so that you can start losing weight, sleep better and achieve a healthier way of life! Please SHARE this post to save and give friends! Regular exercise has HUGE benefits for reducing stress that affects weight loss, sleep and health. 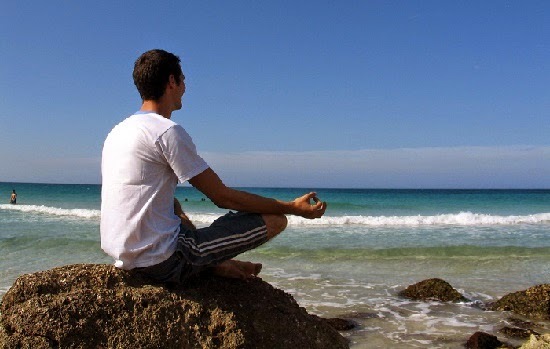 Two of the most popular methods are meditation and yoga. These remedies not only address the mental and emotional symptoms of stress, but can also alleviate the physical manifestations of stress depending on the style of yoga and routines. If you want to completely manage stress, you can take a more aggressive physical stand against it by adding even more activity. Running, Swimming, Tennis, Biking, Basketball or other type of cardiovascular exercise will help ease stress and contribute to better sleep, too. If you are already walking or doing lighter workouts, though are still experiencing sleep and stress issues, then you may need to increase how much you workout (exercise for an hour instead of 30 minutes) or how often you work out (increase to 5 days a week instead of just 3 days). You will most certainly see improvement for weight loss by exercising more. It also helps to switch up the types of exercise you’re doing (day one = walk or run, day 2 = yoga or weight training, day 3 = cycle or stair climb, etc.). That variety doesn't let the body get too comfortable with any certain form of exercise, thus keeping it a challenge and helping the body manage stress. You will notice that I constantly recommend drinking at least 1/2 your weight in ounces of water each day. It is more than a simple case of not feeling thirsty; water and stress go together just like sleep and stress are connected. This is because dehydration causes stress on the body. Water is essential for your brain and other organs to function properly. It can help maintain your heart rate, cortisol level and flushes harmful toxins from your body. Staying hydrated means that you should never feel thirsty and is essential for weight loss, stress reduction and good health in general. relieving foods include vegetables, fruits, fish, soups, yogurt and herbal products. Some stress increasing foods include caffeinated coffee, tea, cocoa and energy drinks. Additionally, fast food, alcohol, soda / pop, sugar / foods with sugar, dairy, nuts and meats. I am not saying that you have to give up all of those foods, but if you may want to test certain ones through an elimination process if you are dealing with health complications due to stress. Food is another culprit for stress, weight gain and health issues. I know this may sound crazy, but body massage can also become an important part of distressing and weight loss. Stress causes the muscles in the body to tense up, slowing down blood circulation and leading the way to more serious health complications. You can avoid these problems by getting a massage once a week or once a month, depending on your budget and how much stress you are exposed to in your daily life. Certain massage also detoxes the body. Detoxing is directly related to relieving you of stress and toxins for weight loss, sleep, and mental health. If your sleep problem does not improve with proper diet, water and exercise, then you should consult with your doctor for help. He or she may recommend something natural like melatonin, chamomile or other natural remedy. There are prescription sleep aids, too. If weight loss does not improve, try Skinny Fiber to increase your dietary fiber, stamina and enzymes. Unnecessary distance from God can create a tremendous amount of stress in your life. You can avoid this through sincere prayer and taking time to study your bible daily. Most importantly the scriptures are filled with what to do and what not to do when stressed, anxious and unhappy. "Be careful for nothing; but in every thing by prayer and supplication with thanksgiving let your requests be made known unto God. And the peace of God, which passeth all understanding, shall keep your hearts and minds through Christ Jesus." ~ Philippians 4:6-7 - All we have to do is come to Him. "Come to Me, all you who labor and are heavy laden, and I will give you rest. Take My yoke upon you and learn from Me, for I am gentle and lowly in heart, and you will find rest for your souls. For My yoke is easy and My burden is light." Matthew 11:28-30 and so on. Read your bible and open your heart to the Lord; his lessons, love and comfort can help you conquer anything! Wear properly fitting clothes. Did you know that many people are stressed out not because of their environment but because of their clothes? Stress can be the offshoot of wearing clothes or shoes that are too tight, thus constricting blood circulation. Reduce the contents of your purse, backpack, computer or briefcase. Carrying heavy bags, especially when you have a long commute wherein you have to stand in the subway, for instance, can cause a lot of stress on your body. You'll be amazed at how much better you feel if you get rid of all the unnecessary items from your purse. Your shoulders and back muscles will thank you. Quit smoking! Smoking is bad for the health and causes a multitude of illnesses and diseases. Stress is just one of the many nasty consequences you can avoid if you quit smoking as soon as possible. "Getting it off your chest" is an important quote to remember. Expressing your feelings and concerns is one of the best ways to manage stress. Holding in what bothers you can cause even more physical and mental stress. If you do not have someone that you feel comfortable sharing with or are at fear for stressing others out with your problems, then you can talk with your doctor, find an anonymous hotline, support group or a therapist. They can help you verbalize and release what is bothering you; plus, offer suggestions for how to manage stress better, too. Please do not forget that YOU CAN ALWAYS turn to God in prayer and the scriptures to help deal with stress. Constant interaction with other people can take a toll on you for sure. We all need a little alone time to think, pamper and rest. For some people, exercising or driving provides that time. Some people need different activities to fulfill that need for alone time and to manage stress. For example, leaving the kid(s) with your spouse or a sitter so that you can go to the park to pray, meditate, read, think, etc. Other examples include reading, going to the beach, fishing, playing golf, taking a bubble bath, going to the movies, napping, computer games, etc. There is nothing wrong with taking the time alone to do things that make you happy. It is also a way to manage stress overload. This is probably the hardest of all. It is pinpointing what is stressing you and dealing with it. I know this seems impossible in some cases, but try to keep an open mind. If driving to and from work stresses you out to the point of physical or anxiety issues, then you either have to find a closer job, move closer to your job or work from home. If dealing with certain people is damaging to your health and wellness, then you need to deal with it. If you can't do it on your own, then relationship therapy can help if the other person is willing to do this with you. On the other hand, sometimes, certain relationships have to go. They are far more toxic than talking, exercise, food, drink or alone time can resolve for you. Whatever or whoever is contributing to making you sick, fat, stressed and / or unhappy ... You have to deal with it because you deserve a better quality of life. Some other affects of stress include aging more quickly, chronic muscle pains (back, neck, etc), GERD (gastrointestinal reflux disease), IBS (irritable bowl syndrome), asthma and DYING younger than you should --- STRESS CAN KILL YOU! 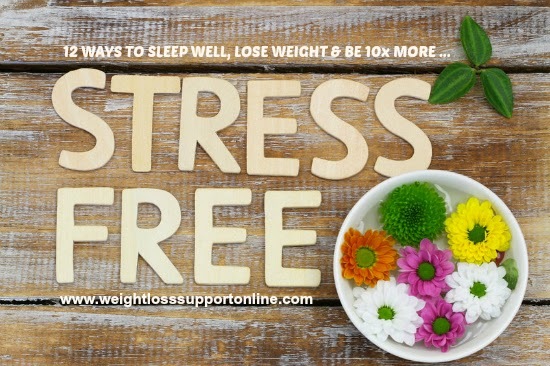 The consequences of stress are so vast that I have been motivated to share these 12 ways to manage stress for your weight loss, sleep and health. I hope that you will try your very best to put into action these simple but effective strategies and also realize that there are many other ways to deal with stress like counting, breathing techniques, music, crafts, taking vitamins and magnesium, etc. I have just shared those I know work from experiences. Please make sure to click the share buttons to give this article to people you care about, so they can learn some other ways to manage their stress, too! GOD BLESS AND KEEP YOU ALWAYS!